Check Out Scanlon Creek Conservation Area for a Nice Hike! Are you in Simcoe County and looking to get out into nature? Maybe you’re passing through on the way up north and need a stop for some fresh air? If these sound like you, Scanlon Creek Conservation Area is worth your time to visit! We had the chance to explore Scanlon in the wintertime (but Eric has been before in the summer and fall). 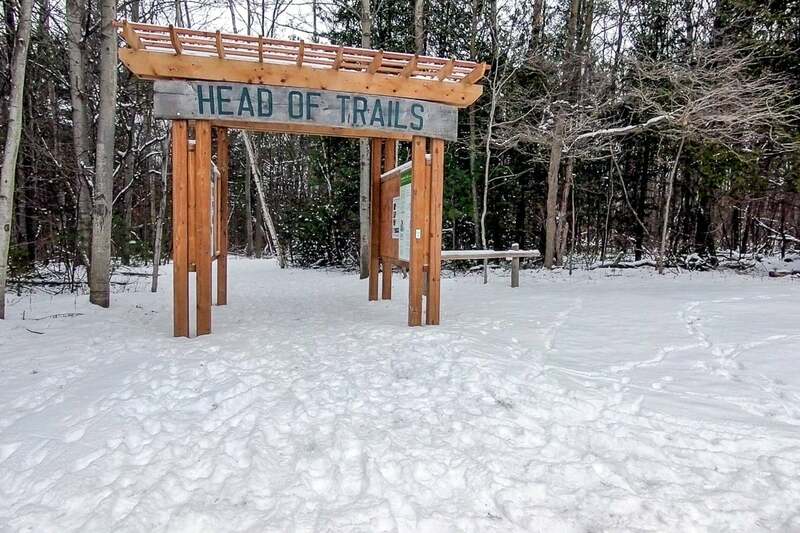 After having such good experiences each time, we wanted to tell people about this “hidden gem” of an outdoor experience just outside Bradford, Ontario. If you are looking for a conservation area near Barrie, Scanlon wouldn’t be the worst option but we’re sure there are other closer options to the north. That said, there are some other great areas close by like Rogers Reservoir, Thornton Bales, and Holland Landing Conservation Area – which we will write about as we check them out! For now, here’s everything you need to know about Scanlon Creek Conservation Area! Look for the Scanlon Creek entrance sign from the 9th Line! Scanlon Creek Conservation Area is located just outside of Bradford West Gwillimbury on the 9th Line. To get there, take Highway 11/Yonge Street to the 9th Line and turn right. You’ll go down a hill and see the entrance sign for the main parking lot on your left. From Highway 400 heading northbound, get off at Highway 88 towards Bradford until you hit Barrie Street in the middle of town. Turn left (head north) and then follow the instructions above. The map at the Head of Trails is super detailed and helpful. Scanlon Creek is 300 hectares of varied landscape. There’s dense forest, marshy low-lying areas, grasslands, leafy forests, a high lookout point, and more. It’s a great place to explore since the scenery changes frequently. In the winter, you can bring snowshoes or cross country skis if there is enough snow! Entrance is free but you have to pay for parking and this is applicable seven days a week. On the official website, you can find the following information: It’s $2.00 per hour or $6.00 for a whole day. You can pay using your phone using the MacKay Pay App and use zone 3101 to register your vehicle. You can download the Avenza App to get a copy of the trail map to your phone. Just download the app, search LSRCA and the appropriate Conservation Area, and download the map to your phone. You don’t meed data once it’s on your phone. If you’d like to learn more about Scanlon Creek, you can check out the official website. The trails are marked well – choose your path! Kingfisher (BLUE) Loop – this loop is the longest and most varied of all the trails. At 3 km, it’s really good for photos, seeing lots of different nature, and even running. This is the one that we did – and it’s pretty popular. Chickadee (BLACK) Loop – staying more to the west side of Scanlon Creek, the Chickadee Loop is 2.8 km of of forests and open areas with pretty leveled terrain. There’s good bird watching here – hence the name of the trail! Eric has been on parts of this and it was nice. Evergreen (GREEN) Loop – this loop is appropriately names because it passes through the center of Scanlon Creek. At 2.5 km, this area is full of varied pine and cedar trees and can get pretty thick i there. There are some steep sections and this can be slippery in the winter, so keep that in mind. This loop crosses the Kingfisher early on so it can get a little confusing which one is which. Sugar Maple (RED) Loop – sticking to the south end of the area, this very flat loop is full of leafy trees. This means that in the fall, you get the best fall colours. At 1.5 km, it’s the shortest loop so it’s good for just getting out and stretching your legs if you want! We really like the trails at Scanlon Creek. The varied nature means that it certainly isn’t boring, and the features like the wooden walkways over the marsh/lake area are great. You can really lose yourself in there (in a good way) and forget that the town and the highway is close by. A designated camp fire pavilion in the woods. Scanlon Creek is a little on the smaller side when it comes to facilities but they still have everything you’d need. There are two picnic pavilions onsite and BBQs which you can eat at/rent out. There are accessible washrooms in two main locations with a few other “outdoor” washroom stalls on the trails. If you are coming to Scanlon with kids and/or dogs, there’s a discovery play area just for kids to explore. Additionally – and this might be important for dog owners – there’s a Bark Park at Scanlon. The entrance is off of Highway 11 (which is different from the main entrance we used/described). We’ve never been to the Bark Park but we were told by family members that it’s huge, well-kept, and great for letting the doggies run. This could be important if you are coming from Toronto or further down heading for cottage country and need a place to let the dog out of the car. Besides these, there are nature centres which are used for education sessions. We’re unsure if you can just walk in in the summertime – they were closed in the winter when we visited! We loved our winter hike at Scanlon Creek – and would recommend! So, should you visit Scanlon Creek conservation area? We’d go with yes. The trails are nice, it’s very well kept, it’s easy to get to, and there’s something for everyone – including the kids and the dogs! And there you have it – our experience at Scanlon Creek. Having been before, it was nice to get out in the wintertime to see the place differently. The trails CAN be a tad slippery if there’s ice underneath so watch for that if you don’t have snowshoes or hiking poles. We honestly aren’t joking when we say that Scanlon is surprisingly large and makes for a great side adventure if you’re coming from the city or just passing through Simcoe County. Stop in and let us know what you think!